Morganton Yoga Offers the Best You Can Do for Yourself. Casual dress - loose fitting clothing. Bring a Yoga Mat if you wish. All MORGANTON YOGA Classes (One and 1.5 hour classes) are $10.00, 3 for $25.00. Yoga for Lunch is $5.00. All classes at St. Charles are $6.00. Morganton Yoga is NOT your Granny's Yoga. It is Yoga with Attitude, an energetic and assertive approach to the ancient discipline that focuses on your body, in the here and now. You will find this to be the fastest hour/hour-and-a-half you spend all week! Taught privately and at the local YMCA in Chapel Hill, NC from 1973 to 1983. 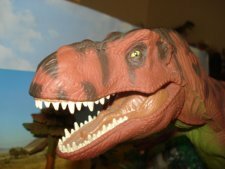 Should you be interested in Dinosaur Toys as well as Morganton Yoga just click here. When it came to my needing a web page to devote to my Yoga teaching I chose to add said page to my website, sort of as a serendipitous add-on. I did not want to create a whole new site, nor did I want to create a social-networking page (I hate Facebook; can't stomach Twitter, and it just wouldn't work for me, anyway.) So adding this page to my Dinosaur site seems appropriate.